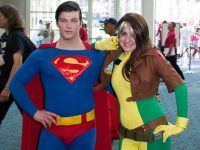 San Diego Comic Con is the place to be if you're a comic and science fiction enthusiast. One of the biggest in the world, the convention started in the 1970s promoting comic books, and grew to include movies, television and other pop culture elements. This is where studios reveal info about upcoming movies, authors and artists do question-and-answer sessions, celebrities sign autographs, and rare collectable merchandise can be found. One of the most fun elements of Comic Con is the chance to dress up as your favourite character, and see what wacky and over-the-top costumes others are wearing.